The fastest growing realization everywhere is that humanity can't go on the way it is going. Indeed, the great fear is we're entering endgame where we appear to have lost the race between self-destruction and self-discovery―the race to find the psychologically relieving understanding of our 'good and evil'-afflicted human condition. Well, astonishing as it is, this book by biologist Jeremy Griffith presents the 11th hour breakthrough biological explanation of the human condition necessary for the psychological rehabilitation and transformation of our species! 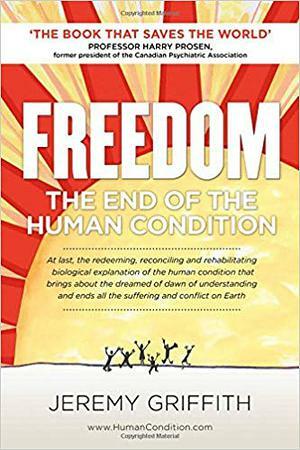 The culmination of 40 years of studying and writing about our species' psychosis, FREEDOM delivers nothing less than the holy grail of insight we have needed to free ourselves from the human condition. It is, in short, as Professor Harry Prosen, a former president of the Canadian Psychiatric Association, asserts in his Introduction, 'The book that saves the world'. Griffith has been able to venture right to the bottom of the dark depths of what it is to be human and return with the fully accountable, true explanation of our seemingly imperfect lives. At long last we have the redeeming and thus transforming understanding of human behaviour! And with that explanation found all the other great outstanding scientific mysteries about our existence are now also able to be truthfully explained―of the meaning of our existence, of the origin of our unconditionally selfless moral instincts, and of why we humans became conscious when other animals haven't. Yes, the full story of life on Earth can finally be told―and all of these incredible breakthroughs and insights are presented here in this 'greatest of all books'.